This procedure describes how to add a Path Map to a server so that files which are called from a certain location on the server will be searched for in a local location during PHP Web Page debugging . Select either the 'Path in Workspace' or 'Path in File System' option and click Browse to specify the location. Your Path Map will be added to your server list. The next time a file is called from the Path on Server, it will be searched for in the local location you have specified. 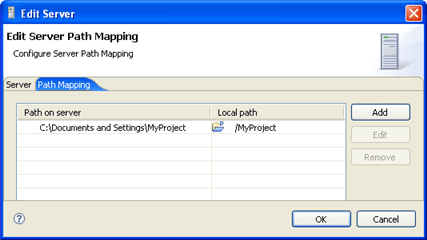 Path Mapping can also be set automatically during Debugging . 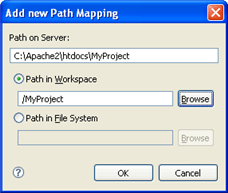 See the Path Mapping topic for more details.